Burning in Water is pleased to present Bluets, a group exhibition of painting and sculpture organized by Sofia Leiby. Please join us for an opening reception in our New York gallery space at 317 10th Avenue on March 10 from 6 - 8 pm. The genesis of the exhibition stretches back to a period when Annie Bielski, Lucy Bull and Sofia Leiby studied together at the School of the Art Institute of Chicago under Molly Zuckerman-Hartung. The three artists began a collaborative project via a shared Google doc whereby they would exchange their writing, representations of their artworks and images from their everyday lives. Over the ensuing years, the three artists have continued this dialogue, which frequently focuses on the complex, reciprocal relationships between their identities and personal lives and their largely abstract art. The conceptual basis for the exhibition was further inspired by Leiby’s engagement with the genre-defying 2009 volume Bluets by Maggie Nelson. In the course of 240 short entries, Nelson weaves autobiographical, poetic and theoretical elements into a book-length meditation on the color blue. Nelson’s often frank remembrances are filtered, refracted and mediated through the perspectives of an array of writers, including Ludwig Wittgenstein, Susan Sontag, Gertrude Stein, Goethe and Proust. In this context, the works in Bluets address the enigmatic, perhaps ineffable, means by which individual identities and personality characteristics are transmuted into color and form. The exhibition is presented in collaboration with support.fm. Bluets is on view at Burning in Water in New York through April 22. After graduating from the School of the Art Institute of Chicago, Annie, Lucy and I started a shared document about painting and our everyday lives, and how they impacted one another. We sent photos of messes in our rooms and the insides of our purses and compared them to our paintings. We wondered how our own personalities were revealed or concealed by mark-making -- could we choose when to withhold, or expose, our relationship to our own hands and color, whether a searing red or a muted grey? "It reminds me that the eye is simply a recorder, with or without our will. Perhaps the same could be said of the heart?" "Two things happened at once: the painting abruptly went beyond itself, lost its solitariness, acquired a relationship to fields, to flowers; and it changed from something I understood into something I did not understand, a mystery, a problem….Were all, or only some, of the elements in it clues? If the lighter, scattered, or broken areas of blue referred to cornflowers, what did the blocks of darker blue refer to, and the opulent white? Or were all the elements clues but some of them to private, unknowable subjects? Was this a representation of an emotional response to cornflowers, or to a memory of cornflowers?" Not all the paintings in this exhibition are predominantly blue— not even most. The biggest clue, and commonality between these works, is not color, but line: the simplest kind of personality inventory. Cora’s lines are weather balloons, attracting lightning or clouds, or wobbly travelers, hastening pace with energy. Rachel’s sculptural lines stand out from the wall. Eli’s thin-veined pomegranates are disemboweled and delicate. Lucy’s lines are feathery and sinuous. Sadie’s are more painterly and Molly’s are handwritten, radiant and collaged. There are also two lamps in the show, one made of underwear and the other an illuminated time capsule. Each addresses ideas of memory, intuition, expression, representation and corporality, and presents each work as patterns of clues. “'Can blue solve the problem, or can it least keep me company within it?' – No, not exactly. It cannot love me that way, it has no arms." Support.fm, founded by Rye Skelton, Blaine O'Neill and Grace Dunham, is creating an internet-based funding platform to provide financial and legal assistance to trans and gender non-conforming (GNC) individuals embroiled in the criminal justice system. Proceeds from Bluets will be donated to help fund support.fm's work. Annie Bielski (b. 1990, Toledo, OH) is a painter, writer, and performer based in Hudson, NY. Bielski received her BFA from the School of the Art Institute of Chicago. She has performed at September Gallery, Basilica Hudson and The Half Moon (Hudson) and at The Museum of Modern Art, Coustof Waxman and Allen & Eldridge (New York). She has collaborated with musician Jenny Hval and performed in her band across the US and Europe. Bielski’s paintings, sculpture and videos have been exhibited at Paris London Hong Kong (Chicago), Motel (Brooklyn) Lodos Gallery (Mexico City) and The Portland Institute of Contemporary Art. An upcoming two-person exhibition with Jessica Williams will open at High Tide in Philadelphia in May of 2017. Lucy Bull (b. 1990, New York, NY) is a painter and ceramicist living in Los Angeles, where she works out of her studio in Thai Town. She received a BFA from the School of the Art Institute of Chicago and studied painting at the Rhode Island School of Design. She has previously exhibited her work at Brooklyn Fire Proof (New York), Microscope Gallery (New York) and Sullivan Galleries (Chicago). Cora Cohen (b. 1943, New York, NY) works in Long Island City, NY. She earned a BA and MA in art from Bennington College, where she studied with Paul Feeley and Lawrence Alloway. The first major exhibition of Cora Cohen’s work was mounted at the Everson Museum of Art in 1974. Cora Cohen: paintings and altered x-rays 1983 - 1996 traveled widely in the U.S. and Europe. Her series of works on exposed x-ray film, Altered x-rays, was exhibited at the Field Institute Hombroich, Neuss in June 2011. In 2013, Cohen was awarded the John Simon Guggenheim Memorial Fellowship. Writing on Cohen’s art has been featured in numerous publications including The New York Times, The Brooklyn Rail, Art in America, Art News, Flash Art, The New Yorker, Time Out New York and New York Magazine. Eli Farahmand (b. 1986, Huntsville, AL) lives and works in New York. They studied fine art at Watkins College of Art in Nashville and Hunter College. Their work has been featured in the Slow Youth publication Strange Magic and shown at Kimberly-Klark (New York). Sadie Laska (b. 1974, West Virginia) received her BFA from West Virginia State University and an MFA from Bard. 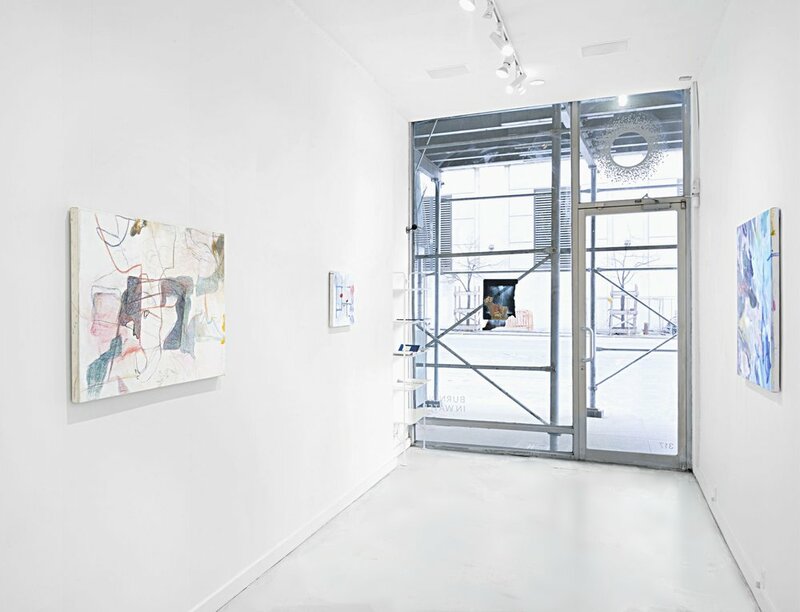 Recent solo exhibitions include Rock Solid at Office Baroque (Brussels); A Foot, Some Guns, A Boot, Some Hands, Some Lips, A Breast at 56 Henry (New York); Plain Air at Galerie Bernard Ceysson (Luxembourg); I Clouded at Canada (New York); Play it as it Lays at Galerie Bernard Ceylon (Geneva); and SAROJANE at Kerry Schuss (New York). She performed music across the US and Europe with her collaborator, artist Lizzi Bougatsos, as IUD between 2007 and 2014. Sofia Leiby (b. 1989, St. Paul, MN) is an artist based in New York. Solo exhibitions include The Making of a Beyonder at Kimmerich (Berlin); Thinking Creatively With Pictures at Clifton Benevento (NYC); and abcdefghijklmnop at Michael Jon & Alan (Miami). Her work has been featured in Artforum, Modern Painters, PAPER and Rhizome.org. Her writing has been published in BOMBmagazine. Rachel Eulena Willaims (b. 1991, Miami, FL) lives and works in Brooklyn, NY. She received her BFA from Cooper Union. Past exhibitions include Dreams come true at Sleep Center (New York); Epizootics at DTCV Firehouse (New York); and Dog Show at Center Street (New York). She completed a residency at the NY Studio Factory in Brooklyn. Molly Zuckerman-Hartung (b. 1975, Los Gatos, CA) is a writer and painter. She lives and works in New York City and teaches in the MFA program at the Yale University School of Art. Her work was featured in the 2014 Whitney Biennial and Painter Painter at the Walker Art Center in Minneapolis. Most recently, she collaborated with Dana DeGiulio in Queen at Lyles & King (New York), which was the subject of an extensive article in the New York Times. Past solo shows include exhibitions at John Connelly (New York); The Museum of Contemporary Art (Chicago); Kadel Wellborn (Karlsruhe); Diana Lowenstein Fine Art (Miami) and Rowley Kennerk (Chicago). She is also a co-founder of the Julius Caesar project Space in Chicago and the author of 95 Theses on Painting.